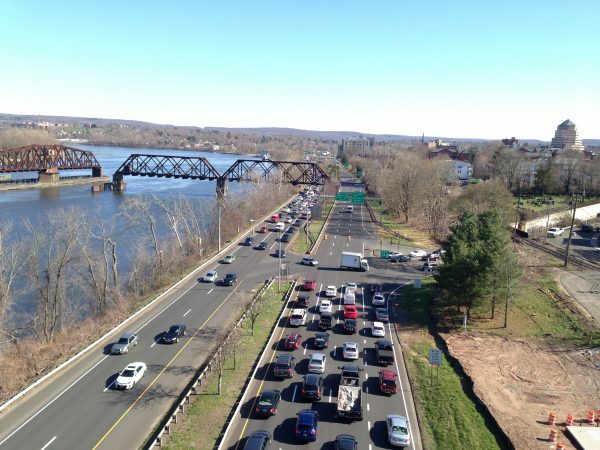 You may be wondering about the status of plans by the CT Department of Transportation to improve traffic on Main Street, the Route 17 ramp onto Route 9, and the proposal to remove the traffic signals from Route 9. John Hall recently spoke with Erik Jarboe at CT DOT about these projects. Here’s what’s going on. The State will install pedestrian bump-outs along Main Street beginning in the spring of 2019. (“Bump-outs” are elevated extensions of the sidewalk surface into the crosswalk area, providing visibility for pedestrians, shortening the time needed for the pedestrian cycle of the traffic signal, and moving cars more efficiently.) The State also plans to make improvements to the St. John’s Square intersection, for which construction may begin in the fall of 2019. This will include a dedicated right turn lane from southbound Main onto Washington Street. As for the removal of the stop sign where Rt. 17 enters Route 9 northbound, the addition of the needed acceleration lane will require widening and partial replacement of the bridge over Union Street as well as relocation of the existing Union Street/River Road/Harbor Drive intersection. This will entail a prolonged permitting process, which is underway. Regarding the removal of the Route 9 traffic signals, CT DOT has engaged a consulting company to complete a comprehensive system-wide traffic study of Route 9, downtown Middletown, and beyond. They are hoping to hold another public meeting with revised plans sometime this coming winter.